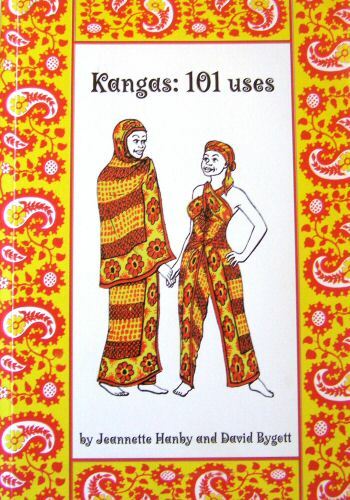 Kanga USA is proud to offer Kangas:101 USES by Jeannette Hanby and David Bygott. This fun paperback book is a tribute to the East African Kanga. The Kanga is that colorful fabric you see in the pictures, it is a patterned fabric which is printed in repeating panels, each containing a Swahili proverb or statement. The author Jeanette, and her husband David, were conducting research in Tanzania in 1974. Since then Jeanette & David have been leading educational safaris in East Africa, most recently with National Geographic Expeditions. Kangas: 101 USES begins with how to knot and tie several different dresses using one or two kangas. Then it goes on to demonstrate head wraps, turbans, swim suits and halters, and ends with lots of other creative uses for a kanga. Also, check out The GIFT Package, which contains one kanga, one KANGA 101 USES, and one set of greeting cards. See the discounted price under GIFT PACKAGE.